ASHEVILLE, N.C., Dec. 13, 2013 (SEND2PRESS NEWSWIRE) — The Music Department of the University of UNC-Greensboro has given The Bob Moog Foundation a collection of vintage synthesizer hardware and other equipment. The gift, which will be on permanent loan at the Foundation, was announced today by the Foundation’s executive director Michelle Moog-Koussa. The gift includes: A custom, vintage Moog Modular synthesizer from R.A. Moog, Co., two ARP 2600s, an Aries Series 300 Modular, Oberheim OB-Xa, Korg MS-20 (Vintage), a Leader Electric LBO-32B oscilloscope, and more. Dr. Bob’s SoundSchool (DBSS), the hallmark educational project of the Bob Moog Foundation, is an innovative 10 week curriculum that teaches second grade students the physics of sound using acoustic and electronic musical instruments such as the theremin, as well as oscilloscopes. The information taught through the musical instruments is supplemented by custom educational materials developed by the BMF educational team. Through DBSS, students learn about: vibrations, waveforms, sound travel through identifying the source, medium, and receiver of sound, parameters of sound such as pitch/frequency and loudness/amplitude, the physical difference between music and noise. In addition to the UNC-Greensboro gift, the Foundation has received additional materials from donors who support the Foundation’s education and historic preservation initiatives. Announcement of those gifts is will be forthcoming in early 2014. The Bob Moog Foundation is a non-profit organization located in Asheville, N.C., that carries on the pioneering legacy of Robert Moog whose synthesizers revolutionized music beginning in the 1960s. The Bob Moog Foundation™ is an independent, donor-driven 501(c)(3) non-profit organization. 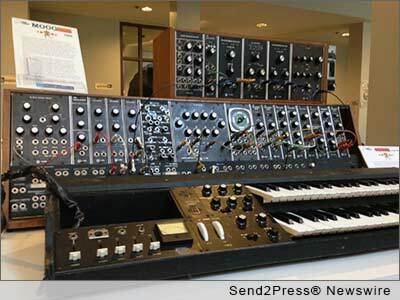 It is not affiliated with Moog Music®, Inc.
* Photo Caption: Custom, vintage Moog Modular synthesizer from R.A. Moog, Co.
– Costs associated with dissemination of this news announcement were donated to the BMF by Neotrope®. Original Keywords: vintage synthesizer hardware, Michelle Moog-Koussa, Dr. Bob’s SoundSchool, intage Moog Modular synthesizer from R.A. Moog, Co., two ARP 2600s, an Aries Series 300 Modular, Oberheim OB-Xa, Korg MS-20, education, nonprofit, University of UNC-Greensboro The Bob Moog Foundation Asheville North Carolina ASHEVILLE, N.C.
REFERENCES: Asheville Business News, vintage synthesizer hardware, Michelle Moog-Koussa, Dr. Bob's SoundSchool, intage Moog Modular synthesizer from R.A. Moog, Co., two ARP 2600s, an Aries Series 300 Modular, Oberheim OB-Xa, Korg MS-20, education, nonprofit, University of UNC-Greensboro The Bob Moog Foundation Asheville North Carolina ASHEVILLE, N.C.